I just wanted to report that I am now 7 weeks out since my surgery. I went ahead and followed Dr's orders and wore sling up until my last appointment which was last week where I was told I could remove it. For normal day to day activities, it feels almost normal - probably 85-90%. Some things still bother it - lifting anything heavier than 30 lbs or applying quick motion or force. I did get back to riding a little over one week ago. I probably could have pushed it and rode sooner but I stuck it out on the stationary bike until Dr gave me the OK. I have still been taking it easy on the bike, don't want to fall over or crash on it as the bone is still not healed yet. I do still have some slight, sharp pain every now and then in the point where my shoulder starts to curve downward into my arm and also behind the clavicle, essentially my shoulder blade area. My Dr told me that was normal and is caused by under use. As for the second opinion posts. I would highly recommend as well. Similar to some of the other posts, my first break (10 years ago) I went to the ER and after 4 hours of waiting finally saw a med school student and was put in a sling and told it would heal on its own. Thankfully, my mother wasn't buying that prognosis and took me to a surgeon for a second opinion. Bad breaks will not heal properly. I know how you feel and dealt with the same questions when I broke my clavicle this summer. The problem is, it feels ok but the bones (in my case) were broken in 3 spots and if I picked up something heavy, yanked on my handlebars or crashed again, I would pull all the screws out and have to have another operation. Not worth it for me, not being a pro. I was mixing outside after 4 weeks and have been riding hard but not racing the rest of the season. I also had several other complications that made it a smarter idea notto race. Good luck and take the time it needs. Update: just the other week, I went in for my follow up surgery to get my Fabian style rode removed; just a couple of days before he did, as it turns out. All in all, I was pretty happy with the procedure and the outcome. I'm left with a couple of pretty minor scars and no hardware. 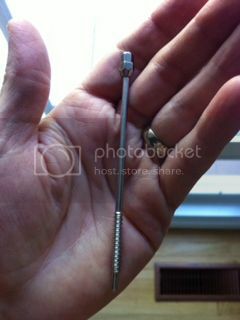 I had only some minor discomfort from the end of the rod as it causes the skin to "tent" at the back of the shoulder. One other caveat, I ended up spending quite a bit of time on the trainer as my fracture seemed slow to form a union for the first month or two. I ended up using a bone growth stimulator that (perhaps?) pushed the bone into fusing. It was frustrating at the time, but I didn't want to risk a dumb fall and put me back to square one - the clavicle pin seems quite efficient at keeping everything held together but doesn't provide much lateral support in the event of an impact - they can bend. My ortho basically said I was good to get the pin removed ~4mo post surgery. Last edited by Beaker; 09-06-12 at 08:34 PM. ^^^^ just like Fabian for sure! you played it smart and made the right decisions. with a non union and no pins that bone basically had no protection from another impact. cool keepsake too. maybe. i bookend my season with bad crashes. this collarbone thing in March, but i was back on the trainer 6 days post surgery and outside 4 weeks post. i raced 7 weeks post surgery and finished 7th. however, i never really felt like i got back on form. hard to explain, but i was always chasing something. form or results? perhaps those two A races in April that i spent 6 months training for? i raced a lot and drove a lot to do so. i did 20 cat 4 races this summer with several top 10s. then last USAC race of they year i get taken out and go down hard. no breaks, but some real nasty road rash from hip to foot. took me off the bike for 10 days. required two ER trips and a visit to a wound care specialist. best advice i got, which i didnt heed; relax, enjoy other things in life, there will be plenty of A races in the future. Thanks -- it was mentally tough being told "you're not ready yet" but I'm very happy with the result. 8 weeks out now. Started lifting weights again today for upper body. Nothing too heavy, am going to start light and work my way back up. Hey all. I just finished my 2 week post-op appointment for a left clavicle repair. I broke it mountain biking. At my first ortho appointment the doctor said I would definitely need surgery since the bones were too far apart ro fuse together. I had a plate and six screws put in about a week and a half after the initial break. Post surgery I only had to wear the sling for comfort. The pain was the worst the day of surgery once the nerve block wore off. Then about 3 or 4 days later I got some residual nerve pain that the doctor said was probably from the bike accident not the surgery. Luckily that has started to reside after almost a week. Two weeks post op I am cleared for the trainer and running. And the recommendation is to wait the full 6 weeks post op before riding on the trails or road to prevent another crash and breaking the bone and the hardware. No physical therapy needed. My only recommendation is that even if you are allowed to move your joints, don't try to stretch overhead forcefully I did it two days after surgery and today was told to abstain from it until 6 weeks. Recently had a crash 10 weeks ago. Went with surgery. Z break like a few others. Seemed like a great idea at the time. I would say, the only positive for surgery, is it gets the clavicle healed faster, you can resume normal activities quicker, and it helps with the physical alignment and issues with all of the the other pieces attached to the clavicle to make it as normal/original as possible. Had I known all the downsides of surgery, would think again, although healing naturally would have been a nightmare surely. Already broke this clavicle when I was a kid, but it didn't bother me as much when I was 12-13yrs old like now of course. Double edge sword. The surgey/titanium itself is great for the healing part. The rest, not so much. 1) Numbness below the incision and next to it. Likely never get the feeling back. Most don't. Don't be fooled if somebody tells you, "it might go away in a year". 2) Plate is protruding up in a bad location right where the seat belt comes across. Like this little dime size lump slightly. I have a feeling this thing could pop through the skin if left in my body for a year or two after constant rubbing/movement of the skin. It has happened to a lot of people. 3) Still takes 8-12 weeks to really start to feel normal. Healing is really in the 4-6 month range. Drs don't like to tell you a lot of stuff unless you ask. My physical therapist gave more details about recovery than the damn Dr running his assembly line. Do physical therapy if you need it. I lost flexibility/strength more than I thought. Helped get me back to "normal" faster and regain mobility/strength. 4) Still a binding feeling/flexibility issues where the plate is in that area. That likely won't go away either. I can tell, it isn't the same in that area. Maybe if the plate comes out, it will improve in that respect, plus the rubbing thing/poking up in my skin the plate issue. The alternative I guess is longer healing time of the bone itself, plus you posture/shoulder and all that stuff might not be normal ever again and symmetrical as it should be. And my break was pretty bad, 37mph sh*t whipped right onto the ground on a sprint finish. Ribs broken/vertebrae and clavicle. Fun. Side bar, did some reading of studies about removal of plates in the clavicle. Most Drs will tell you, leave it unless there is some reason it has to come out. Well, one study I read showed they still recommend this, except, over half of the people in the study were NOT satisfied with the surgery/plate in their shoulder, limiting movement, other issues, like I listed above. And the 60% of the total people in the study, had it removed, were glad they did! Not one person said, "wish I still had that plate in my shoulder!" As much as the thought of taking it out and the possible pain again/crap you deal with afterwards of the surgery, the issues with it being in my shoulder now about 12 weeks after, plus having physical therapy, and now really the past two weeks starting to train/ride seriously again, I want it out more and more right now actually. People should really understand it should be presented as a two step process by the Dr. So, faster healing/alignment etc...a big plus and surgery is a good choice. But the list of negative things is long as well. Not a perfect solution. I broke the same collar bone twice, surgery both times. The only lingering issue is that every few months I have a tingling sensation that runs down my arm for several seconds and then it is gone. I have full mobility. Hey there... I found your page when looking for information about surgery for a broken clavicle. I was seen at Griffith Hospital and was discharged for conservative care (sling) after consultation with the orthopaedic team at Wagga Wagga. I was not happy with that so sought review at The Alfred in Melbourne. They too were confident with me to be managed conservatively. I have had to stay with my mum and be seen by her GP. He sent me home with a figure eight brace. I have just returned from my review and 3 weeks post break and there is no visible bone growth so I have perused my first instinct to see a surgeon in Melbourne, Austin Vo. I work in the sheep industry... Not shearing but everything else. I want to be as strong as possible. Hope someone out there can give me a bit of reassurance. Figured I'd post this here as we likely have a good cross section of racers who've crashed, broken their collarbones, and had a plate installed. I found out today that I broke my left collarbone in a crash last week; the initial ER x-rays missed the break and it's been separating the past few days as I wondered why I wasn't recovering faster. The ortho took some follow-up x-rays today and I was blathering on about not having any breaks..the tech paused and said, "Are you sure?" It's about 1/2" separated now..
After some review of my options, I'm going in Thursday to screw it back together with a plate. If you've had this operation, I'd like to hear how long recovery took you, when you got back on the bike, whether you had any long term impairment of the shoulder, complications, etc. I know this is an old thread but I wanted to add my two cents. Make a long story short, hit a pothole at 160kmh, went into a tank slapper and into the ditch. Broke left collar bone (bad) as well as other injuries. Have a plate with twelve screws. Three months in a sling and sleeping in a recliner. While doing physio they noticed little movement in my shoulder. Operation number two ( frozen shoulder) Came out of that with the worst pain in my life. Would not wish that upon anyone. Lots more physio and copious amounts of pain meds I now have about 80% movement in my shoulder. This is nearly four years ago now and I still get massive pains in my shoulder, mainly where the plate is. It feels like someone jabbing me with a knife. After reading all these other "success stories" it kinda makes me wonder why I went through such hell with mine. Sad you folks are having issues. My plate doesn't bother me a bit, other than the fact that I can see it. I guess that means I'm keeping the weight off, I suppose. Saw an email come up for this thread, figured I might as well update on my long term (7 years now!) experience. I still have the plate in my shoulder, it doesn't bother me in any way. I still have a slight bit of numbness on the front of my deltoid on that side that seems to be permanent. I am lifting weights fairly heavily still, along with riding, and I would probably do the surgery again. Hope I don't need to..
Often I ride with regular everyday pants and a band over my right ankle to keep the pant leg secure. What would you recommend instead so that something like happened to your friend never happens? What was he using to secure his pant leg? All climbs are much harder if you have to chase somebody fitter than you up the hill. Avoid that at all costs. I can't recall the last time I went up a hill with pcad. Now I know why. Tongue in cheek, I'm sure. Of course, I'm always chasing someone up a hill, and avoiding that is really out of the question. Well might be good to share here as well. I broke my collarbone back in 2014. It was a break with quite some separation as well as 2 shards that fractured off both ends (so the bone was essentially in 4 pieces, 2 main ones and two shards). They operated it after a week where i was in a lot of pain despite painkillers. After the operation i had to remain inactive in a sling for 6 weeks, but other than that the operation was fine and i had nearly no pain after the initial trauma of the operation healed. healing of the bone went superbly and i was very quickly painfree after the operation so that is a definite plus. The long period of inactivity meant it took some months after getting rid of the sling to get back to full mobility and strength in my left arm. I would definitely advise to work with your doctor for a progressive approach to starting to use the arm again, this will limit issues with strength and mobility down the road. Now that was the first time i broke my collarbone. This year i broke the same collarbone again. The plate was still in and this created a more complicated situation. The bone broke next to the plate close to the joint at the shoulder side. Luckily i visited a specialist who was able to fix it with a plate again, but as he said many would not have been able to perform that surgery. Then i would probably have ended up having a piece of bone removed and getting a permanently shortened collar bone. So operation of a clavicle break in general leads to faster recovery and subsidence of pain but the risk of reinjury is real and could lead to a more complex break in the future. So if you get it surgically fixed think about removal of the hardware if you remain at risk (which ofc you are racing bikes). Yes it was on a motorcycle. 1200cc Buell. This is exactly why I got mine removed. Coming out was 10x easier than going in, but there is additional risk since it's still surgery. Doctors are really split on if it should come out our not. My doc is a rider and also a good buddy, he said it was my call. The Nurse at the clinic said they are intended to be permanent and I shouldn't get it out. The internet says all sorts of ***t.
I'm glad I got it out and would get it out again. Only one day of pain pills, a few days of the green stuff and I was back on the trainer in just over a week. I broke mine early 2016’ MTBing on a Saturday. Had to walk out 30 min then had a buddy drive my car an hour to my house then to the hospital. All in 3 hours from break to hospital. I really didn’t hurt that bad, had it slung with a jacket, definitely manageable. Xrays at hospital showed it was broken and displaced so got a sling and a bunch of narc pain pills. Called buddy who is an Orthopedic surgeon. Started to really hurt Sunday. Said come in Monday first thing which I did. Said it was broken bad enough they wanted to do surgery ASAP on Wed. Had to postpone another week due to coming down with bronchitis (awesome). Another week of pain pills and couldn’t sleep to save my life, between the coughing and my shoulder locking up. The day after surgery I felt 95% better. I can’t imagine not getting surgery given how I broke it and the pain I was in, I would have been out of work a month. As it was I was out 2 weeks, which would have been 1 week had it not been for getting sick. After surgery every day I felt a bit better. Got on the trainer pretty quick and was doing easy rides in 6 weeks. Raced (poorly) about 3 months after surgery, but it felt good to be back on the bike. Had surgery to remove plate 9 months after getting it in. Piece of cake. A week off the bike and then I was training again on trainer. Very little pain. Once the holes in the bone were filling in adequately I was back riding outside, probably 5-6 weeks. Breaking it didn’t hurt that bad. 3-4 days after the break was the worst. Worst of it ALL was the friggin’ pain pills and side effects, both physical and mental. The reason I got sick, the doc thought, was due to the pain pills too. They really slow your breathing and I was on my back slouched and inactive for several days, which apparently can lead to lung issues. Getting confidence back on the bike was difficult, but I just worked at it slowly. Riding a bit faster each ride. Yoga really helped me get mobility back, I’d say I was 95% after 3-4 months and I’m 100% now. If I break it again I’m going to do everything I can to not get surgery if I can avoid it and heavily medicate myself using Cannabis and some other ‘natural’ methods if I can get by, which is case by case. Yes old thread but it was interesting to me when I was trying to find info after my crash and surgery, so I'll post my update. Broke in three pieces, got the plate and screws. At first was super happy that I had chosen surgery (pain stopped, alignment good, got back on the bike relatively quickly). Then I was bummed because six months out still no x-ray visible union. But I just got back from follow-up eight months on and the bone is healed. Point being - if you are an oldish guy like me (48), be patient. I have been pretty much full function other than no upper body weight training or heavy exertion since about 3 months in. I will also say that the skin over my plate was numb and weird for probably six months but I did regain full function. It is definitely visible under the skin but based on what I've seen on the internet probably less so than natural healing. 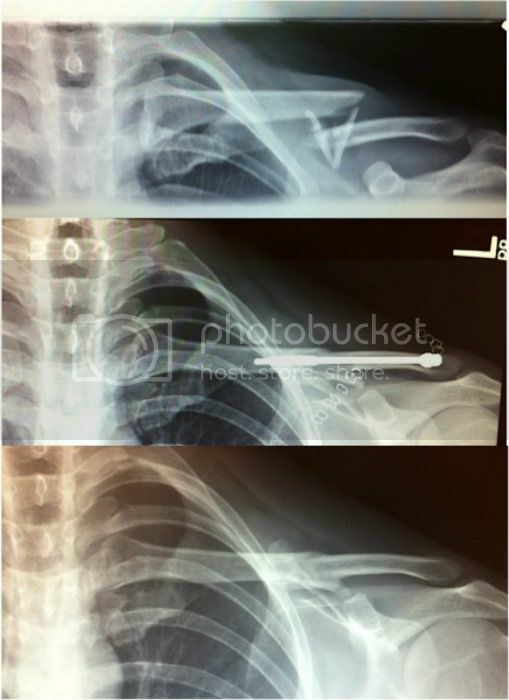 I broke my right collarbone in a race in 2013 and it was plated. A year plus later, I was on a training ride and a car on a cross street came up to a stop sign, stopped, looked both ways for cars, and pulled out about 20 feet in front of me. (To his credit, the guy stopped, waited for the police and ambulance, and had this "I can't believe I did something so stupid" look on his face. He called me the next day to apologize.) I went to the ER where they x-rayed me and told me there were no broken bones. I did a follow-up appointment with my ortho doc; he called up the x-ray, looked at it and cracked up. "C'mere, lookit this!" The plate was bent and the bone was broken at the bend. He decided it was best to leave it as is and let it heal. No problems since, but the collarbone is sensitive to external pressure - if the Army ever recalled me from retirement I wouldn't be able to carry a ruck.